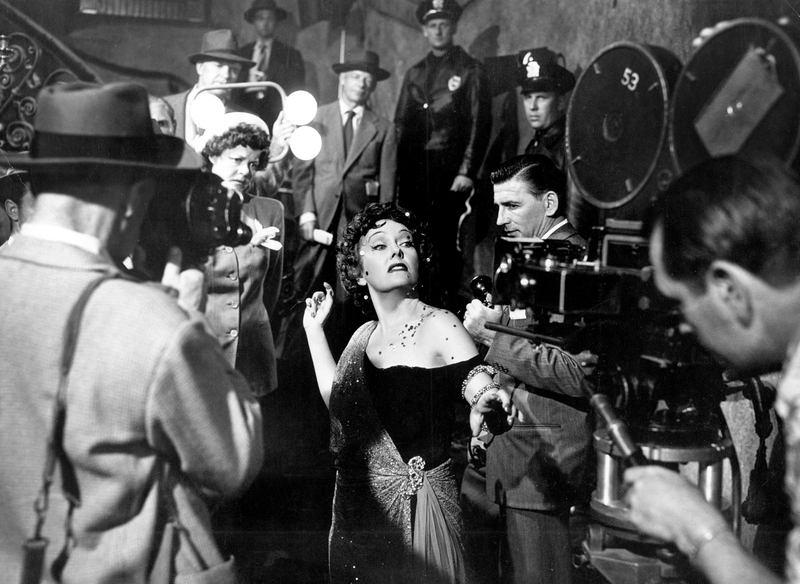 written by Charles Brackett, Billy Wilder and D. M. Marsham, Jr.
Sunset Boulevard is one of those classics that I had never gotten around to see in its entirety. The only thing I vaguely remembered from film school was the last scene of the movie, when aging silent film star Norma Desmond (Gloria Swanson) descends the staircase of her mansion and utters the line, “Alright, Mr. DeMille, I’m ready for my close-up.” It was a memorable finish, and now that I see it in context, boy, what an ending it is. 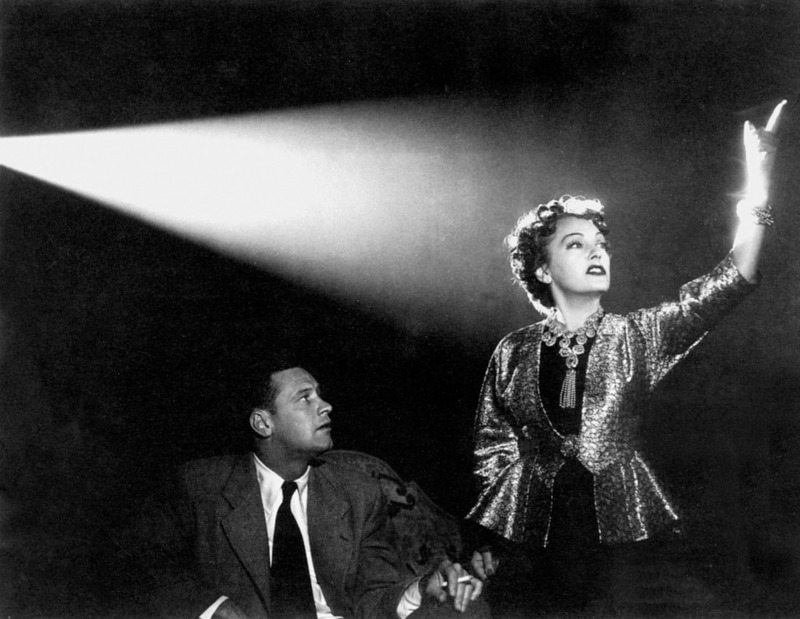 For Sunset Boulevard film is many things at once: Dark comedy, soapy melodrama, with a bit of noir thrown in. But above all, it’s a scathing satire of Hollywood at a time when Hollywood was all-powerful with pomp and circumstance. It was a risky project that could’ve ended director Billy Wilder’s career in an instant. In fact, in order to get it past film censors and Paramount Pictures executives, Wilder and co-screenwriter Charles Brackett submitted just a few pages at a time for approval – a gutsy move indeed, but a card Wilder could play on the strength of his hits Double Indemnity (1944) and The Lost Weekend (1945), made for Paramount a few years before. The story is simple: Joe Gillis (William Holden) is a struggling screenwriter who’s desperate to make a name for himself. Broke and about to lose his car, he hides the vehicle at a seemingly abandoned house off Sunset Boulevard. He discovers that the residence belongs to once-famous actress Desmond, a woman who lives in an illusory world where she’s still adored by legions of fans who await her return to the silver screen. She shows Gillis a script she has written about her life, asking him to polish it so she can present it to legendary director Cecil B. DeMille. Strapped for cash, Gillis obliges, moving into her home and using the older woman’s infatuation with him as a way to enjoy a lavish, comfortable lifestyle. But this honeymoon won’t last: Gillis falls for a much younger woman, making Desmond go on a jealous rage where she shoots him repeatedly to death. The final moments have her surrounded by policemen and reporters, clearly insane and imagining she’s on the set of a new movie that will surely be the comeback hit of her career. It’s sad, haunting, and an apt metaphor for getting old in a business where one day you’re a star and the next you’re gone. It’s an expert balancing act of comedy and tragedy, and I can only imagine Paramount’s reaction when they watched the final film. Choosing real-life silent film actress Swanson to play Desmond was an inspired choice, since she had experienced firsthand the waning of popularity that actors felt after the industry transitioned to talkies. And casting director DeMille as himself was a genius stroke, since he had also worked with Swanson during the silent movie heyday. Sure, Swanson overacts and the romantic subplot between Gillis and a script reader (Nancy Olson) is a bit silly. But add Franz Waxman’s luscious score and John F. Seitz wonderful B/W cinematography, and it’s easy to see why Sunset Boulevard is considered a classic. This is a fine Hollywood movie about how awful Hollywood can be… and that ain’t easy.